Los Angeles, CA – April 8, 2018 – Astounding young entrepreneur and 2020 Democratic Presidential Candidate Andrew Yang will bring his vision for America, Humanity First, to Los Angeles with a campaign rally in Downtown LA’s popular political rally spot Pershing Square on April 22 at 6 pm. With a platform that speaks to the concerns of all Americans young and old, notably jobs, the economy, and smart planning for a challenging future, Yang has been a surprise success on the campaign trail and is currently seventh in the “Money Primary,” ahead of such Democratic Party stalwarts as Julian Castro and Elizabeth Warren. The keystone of Yang’s campaign is his support of Universal Basic Income (UBI) or as he calls it, the Freedom Dividend. UBI is a form of social security that guarantees a certain amount of money to every citizen within a given governed population, without having to pass a test or fulfill a work requirement. The dividend he is proposing for the United States is a set of guaranteed payments of $1,000 per month, or $12,000 per year, to all U.S. citizens over the age of 18. In the next 12 years, 1 in 3 American workers is at risk of losing their jobs to new technologies—and unlike previous waves of automation, this time new jobs will not appear quickly enough and in large enough numbers to make up for it. To avoid an unprecedented crisis, a new solution, unlike anything tried before is required. It all begins with Universal Basic Income for all American adults, no strings attached – a foundation on which a stable, prosperous, and just society can be built. For more about why Andrew Yang believes so strongly in Universal Basic Income, read his book ‘The War on Normal People’ published by Hachette last year. 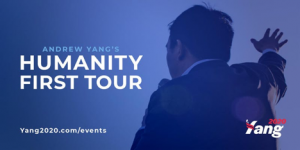 In addition to UBI, Yang has well thought out policies on numerous issues including the other two pillars of his platform: Medicare for All and Human Centered Capitalism. His Southern California friendly policies also include Combating Climate Change, Reducing Mass Incarceration, Gun Safety, Increasing Teacher Salaries, National Marijuana Legalization, a variety of affordable higher education plans, and much more at https://www.yang2020.com/policies/. Yang was born in upstate New York in 1975. His parents immigrated from Taiwan in the 1960s and met in grad school. His Dad was a researcher at IBM — generating over 69 patents in his career—and his Mom was a systems administrator at a local university. He studied economics and political science at Brown and went to law school at Columbia. After a brief stint as a corporate lawyer, he launched a small company in the early days of the internet and then worked for a healthcare startup, where he learned how to build a business from more experienced entrepreneurs. In his thirties, he ran a national education company that grew to become #1 in the country. During that time he met and married his wife – Evelyn Yang. His education company was acquired, and with Evelyn’s support, decided to commit to creating jobs in cities hit hard by the financial crisis. By that time, he understood the power of entrepreneurship to generate economic growth, founding Venture for America (VFA), an organization that helps entrepreneurs create jobs in cities like Baltimore, Detroit, Pittsburgh, and Cleveland. In its first year, VFA trained 40 Fellows. By 2017, more than 500 VFA Fellows and alumni have launched dozens of companies and helped create over 2,500 jobs across the country. He received awards from the Obama White House, being named a Champion of Change in 2012 and a Presidential Ambassador for Global Entrepreneurship in 2015. Current and potential supporters who would like to attend the April 22 Pershing Square rally in Downtown Los Angeles on are encouraged to register here.